As Governor Rochas Okorocha of Imo State Biafra Land has continued to be at the forefront of the campaign against the much anticipated Biafra referendum; he a few days ago, decided to test his popularity in Owerri outside his imposition as a flag-bearer of a political party during Nigeria’s previous dubious elections, when he announced an Anti-Biafra campaign rally to be held in Dan Anyiam Stadium in Owerri on Tuesday 4/7/2017. According to the report reaching Family Writers Press newsrooms from Owerri Imo State Capital, Gov. Rochas Okorocha mapped out and wasted 10, 000, 000 Naira for the rally against Biafra restoration struggle and the imminent Biafra referendum at this time when most Imo State workers are still gnashing teeth due to hunger occasioned by non-payment of workers’ salaries for months now. What could be the higher way of demonstrating wickedness by the Sokoto Caliphate-imposed Gov. Rochas Okorocha against the hardworking good Biafrans of Imo state than this high degree of wickedness which Gov. 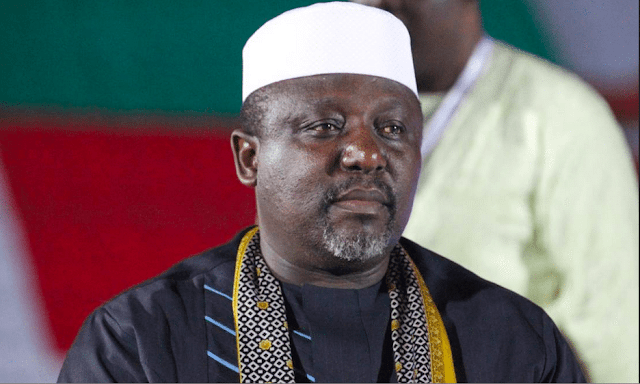 Okorocha of shame is doing against Imo state workers? According to Family Writers correspondent Mazi Ben Alvin Obi, Gov. Okorocha wasted the mapped out resources which a senior staff of the Douglas House, who plead anonymity revealed was Ten Million Naira as his agents were going about hiring hungry youths and Keke NAPEP drivers and promising them 3500 Naira should they agree to gather in Dan Anyiam Stadium at Owerri for the said useless rally. Still, according to Ben Alvin Obi, less than 100 hungry youths who were financially induced were sighted fulfilling formality and accepting to protest just to get the #3500 stipend from Rochas Okorocha's agents of darkness because most of the youths are hunger ravaged and poverty stricken. A question still remains "does Rochas Okorocha mischievously believed that he can use the money to divert the attention of Biafra youths away from the torrents of the need for Biafra referendum, especially on a mere peanut change like ₦3500"? This is the height of insult on the people of Owerri in Biafra Land who were deliberately impoverished by same Gov. Okorocha as his government continued to hoard the salaries of Imo state workers. It is regrettably unfortunate that Gov. Okorocha is now cynically exploring the ugly situation associated with his artificial creation of poverty and hunger in Imo state due to non-payment of workers’ salaries by converting same people as means of gathering followers with financial inducement. But how long will Gov. Okorocha be able to sustain this type of ugly business against Biafra referendum especially now that he may not be getting enough resources from Abuja allocation to be funding the prodigal expenditure associated with the government of Douglas House? However, the high point of the saga of Gov.Rochas Okorocha’s planned anti-Biafra campaign rally in Owerri is that when he reached Dan Anyiam Stadium, his proposed venue for the rally, he met an empty Stadium and only the presence of few numbers of his APC facilitators of his useless rally. Even as he ordered the closure of Markets inside Owerri, yet Owerri people ignored the foolish Fulani-fathered Mr. Okorocha and went to their normal lawful businesses and routine engagements. Biafrans in Owerri have once again showed Rochas Okorocha that it is only Mazi Nnamdi Kanu (De Great) that can command protest or rally and it will be held even on the moon without any financial inducement because even in his adopted village in Orlu, nobody can be commanded by him except for the few hungry ravaged youths who want a daily bread through the stipend. It is important for Okorocha to understand that he may financially induce young Biafrans who he has inflicted with poverty and hunger against any other thing but not against Biafra restoration struggle or the highly expected Biafra referendum which is already imminent because such inducement will always end up in futility. As Gov. Rochas Okorocha has tested his popularity today and discovered that he has no genuine respect, popularity, and control of the people that he thinks he is ruling, This is just the beginning.